It's been a very emotional day. I didn't think it would be this bad after ten years. I was wrong. Yeah. Love to you all. Spent the day in Waller (Texas), helping the people who are helping the animals who have been lost or injured as a result of the wildfires. It's very sad - but also uplifting...the amount of donations received and the offers of help have been incredible. Texans are very good at pulling together and helping each other out! 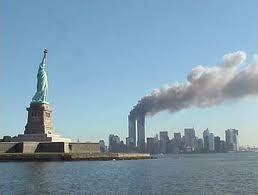 Poignant, as this reminds me so much of 9/11. Also (new topic) - earlier today, someone had me read The Queen's Cloak (the myth) - it connected in me immediately to yesterday's blog on crafts!